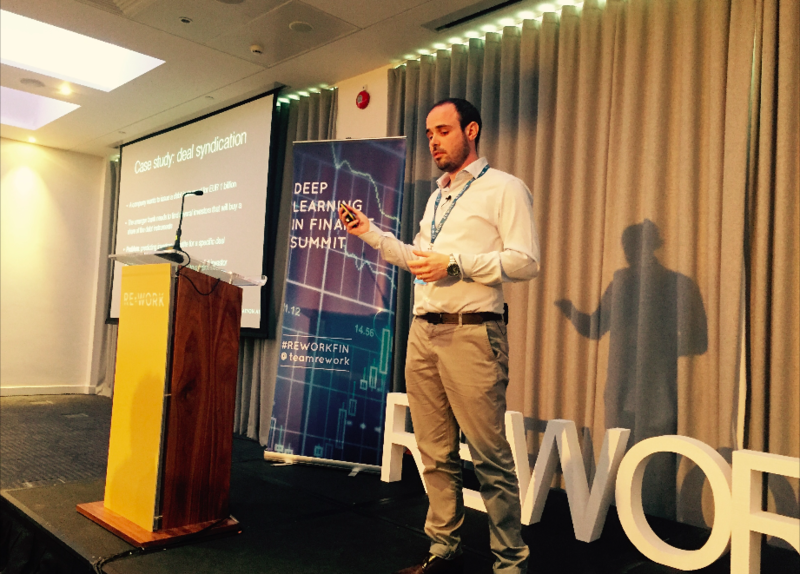 @JoakimPrestmo: Last day of deep learning in finance summit #reworkFIN This'll be a great day! 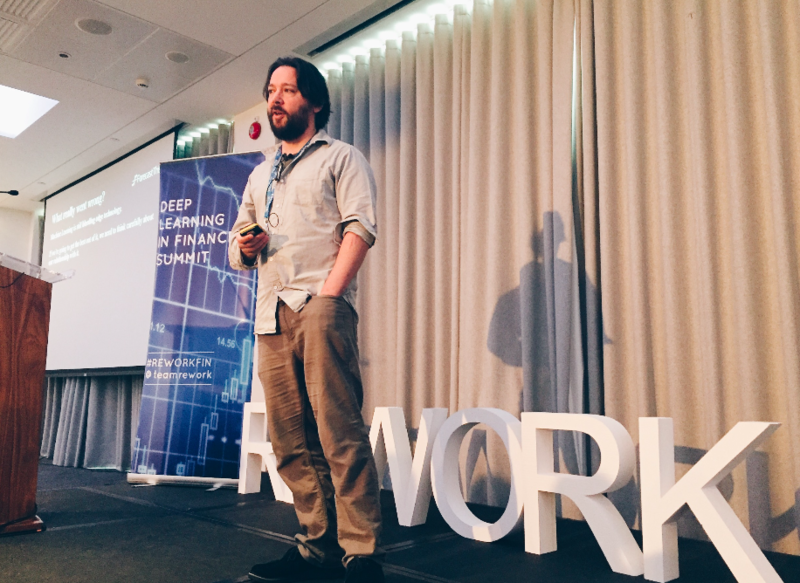 Back for day 2 of the Deep Learning in Finance Summit, we heard from the startups using AI and deep learning (DL) to drive their profit margins and make smarter, machine driven decisions. Jakob Aungiers from HSBC and our compare for today kicked off this morning’s discussions by introducing four FinTech startups who are disrupting the industry with their implementation of AI and DL. Wiener explained how they are using machine learning (ML) to turn unconstructed data into commercial insight to help insurers understand risk in an empirical way. They have ‘built a risk engine that structures multilingual unstructured text using natural language processing, and use AI machine learning algorithms to train these models to structure the mountain of unstructured data’. These include neural network based sentence multi-class classification and unsupervised topic clustering, and can be applied to create synthetic loss event data sets from openly available data. For example, in the case of a restaurant Cytora collect data such as opening hours, website, whether or not they do takeaway, locations etc. and they have found that, using this example, ‘a restaurant in a city centre that is open late, serves takeaway but has no website has 30% more risk than other restaurants.’ The algorithm they have created to read and aggregate these formulas across a variety of data takes roughly a day, whereas it would take a human 5 years to read the same data. Alpha-i are overcoming these obstacles by the implementation of Bayesian methods combined with DL. The Alpha-i DL network is able to make forecasts from a time series as well as associating each prediction with a confidence level, which is derived from the information about the model and the data available. He continued the discussion by telling us how they are ‘leveraging on the power of DL methodologies with the aim of delivering accurate time series forecast with their uncertainties’. One of the key aspect of this Bayesian deep learning methodology is its aversion to over-fitting obtained thanks to the robust probabilistic inference framework. Bayesian inference methodologies can significantly boost the online performance of Alpha-i’s machinery and they are currently working to optimise and improve this. ForecastThis are working with both humans and computers together to produce optimum results. For example, whilst ‘computer power has been getting better and better for the past 20 years, but the best chess players today are still human-computer teams.’ He emphasised that we shouldn’t put too much trust in computers due to DL still being such an unknown area. However, this collaboration does not mean ‘having a human gatekeeper overriding computer decisions’, but using human logic to assist the features. He expanded on understanding the uncertainties and using visualisation techniques to leverage the brain’s inherent computing capabilities and comprehension. In the Q&A, our compare Jakob asked whether working together with DL will lead to job cuts? Washtell-Blaise answered ‘I hope not, but the evidence from chess, not that I’m saying chess and investiment management are the same thing, but it’s commons sense to have humans in the loop - our minds work differently to machines, I can’t say how it’s going to work’. What usually springs to mind when we think of investment banking? 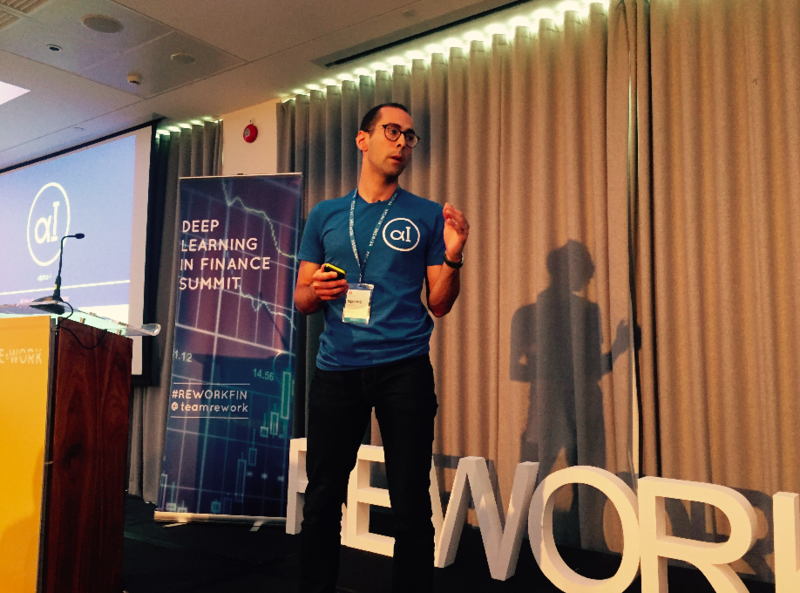 Daniele Grassi, CEO & CTO of Axyon AI summed it up pretty well saying ‘we think of Wall Street and people in nice suits’, and he went on to tell us how this isn’t the whole story. Investment banking represents a high-margin finance field, and he expanded on the notions from this morning that in this industry AI and DL are still under-exploited. In investment banking, the data used comes from 2 main sources: ‘data providers which are available to subscribers, and proprietary data which is keep internal to the financial institution.’ The data is spread across several databases and applications from data providers which is often unlabelled and disjointed. However, for DL to be successful, large amounts of data are required and this is where investment banking has a huge advantage due to the depth of the data. He expanded on the barriers of domain knowledge, data quantity (it’s often spread over a variety of databases), and privacy and licensing terms, and explained how they are using DL to overcome these issues. ‘The most crucial challenge of all is moving from accuracy to value and defining what it means for your model to be successful, and have a fully functional product to demonstrate to your client.’ Axyon’s DL solution provides accurate predictive models, and helps corporate clients optimise their processes as well as reduce risks and increase revenue. 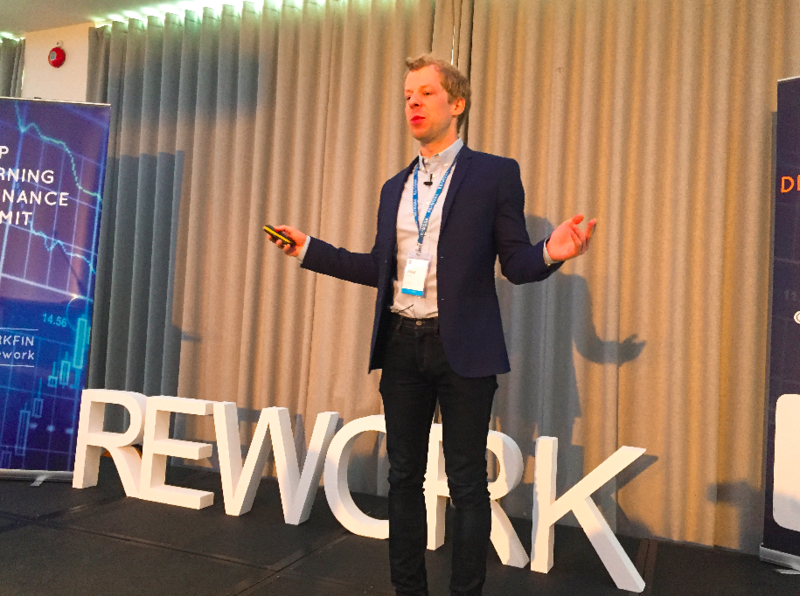 Running alongside this summit, we’ve also had our Deep Learning in Retail and Advertising Summit, and you can view the day 1 highlights here. Register for on-demand post-event access to receive all the slides, presentation videos and interviews from the summit, or check out our calendar of upcoming events here.